TARRC, the UK-based arm of the Malaysian Rubber Board, is pleased to invite you to AAPEX 2014, at the Sands Expo Center (Venetian Hotel), Las Vegas, Nevada from 4th - 6th November 2014. Booth 9504. 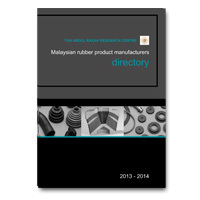 If you are looking to source high quality, competitively-priced rubber-based products come and claim your FREE 2014 Directory of all Malaysian rubber product manufacturers and materials suppliers from our Booth 9504.